Spider-Man: Into the Spider-Verse is the best Spider-Man movie in a really, really long time. Yes, Tom Holland's introduction of Peter Parker into the Marvel Cinematic Universe via Spider-Man: Homecoming was a much-needed jolt of sprightly energy, but was nonetheless a little hamstrung by its very inclusion in the MCU. Spider-Man: Into the Spider-Verse, however, exists in a universe all its own. Well -- universes. "The question we all had was, why another Spider-Man movie?" one of the three co-directors, Peter Ramsey, told Thrillist. "There have been so many, and so many good ones, that the only real reason to do it was to do something which would be a real break with those and allow you to tell the story in a completely new way." Believe it or not, it's easier to just watch the movie than to try to explain the mechanics of it in words. An attempt: In a universe not too far off from our own, an aged Peter Parker dies attempting to stop the Kingpin from opening a tear in space-time, allowing individuals from other dimensions to fall into his own. Miles Morales, Marvel Comics' newest version of Spider-Man introduced in 2011, witnesses Parker's death and takes up the Spider-mantle, working alongside a number of other displaced Spider-characters stuck in his world -- including Spider-Man Noir, Spider-Pig, the robotic SP//DR and her human companion Peni Parker, and Gwen Stacy a.k.a. Spider-Gwen -- to put all of their universes back together again. Because there are an overwhelming number of iterations of Spider-Man and various Spider-people, how did Ramsey and his co-directors Bob Persichetti and Rodney Rothman go about picking their Spider-team? "The interesting thing is this: The cast of spiders that ended up in the film was the original choice from the very beginning when there was an official treatment from Phil [Lord] and Chris [Miller] and then the first draft of the script," Persichetti said. "Over the course of making the movie, just thinking about all of the different possibilities, strangely enough we ended up right back at the choices they made." Miles Morales, though, was always going to be the star. 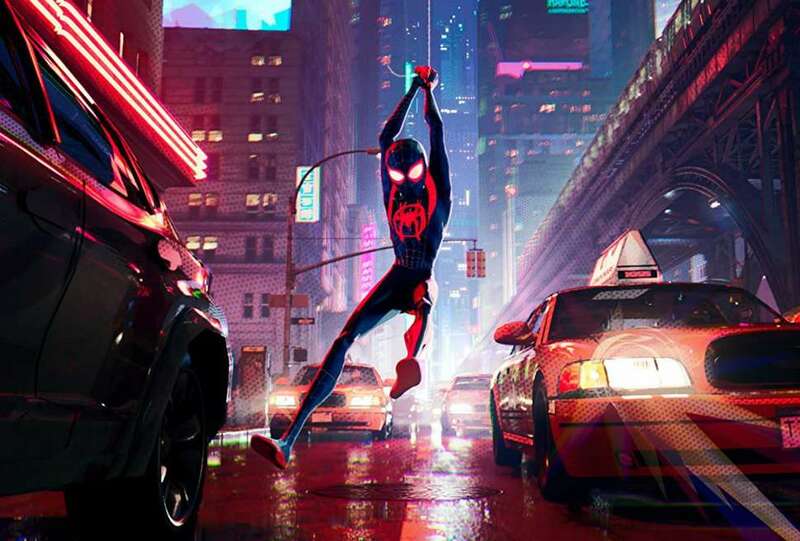 "When Phil and Chris were first approached about the project by producers Amy Pascal and Avi Arad, they weren't interested in doing an animated Spider-Man movie unless it could be the Miles Morales' story," Ramsey explained. "They really loved what Brian Michael Bendis had created with him." In case the only Spider-Man you're familiar with is Peter Parker, Morales was created in 2011 by comic book writer Bendis and artist Sara Pichelli as a new, more diverse hero inspired by both then-president Barack Obama and rapper and actor Donald Glover. He's biracial, black and Latino, and inherits the role of Spider-Man after getting bitten by yet another radioactive arachnid and watching Peter Parker get taken out by the Green Goblin. Morales comes to life with the help of Shameik Moore, who provides the young character's voice, and found that his experiences parallel the comic hero's in ways that helped him make the character his own. "When we cast Shameik, he really took on a really specific characterization," Persichetti said. "He had a somewhat sheltered life, he had two loving parents -- Miles has the same thing. He has two loving parents, he's in the city, he tries to escape and go out there with his uncle. All of these things really resonated with Shameik, and they helped really color Miles in a really realistic, naturalistic, and honest way." 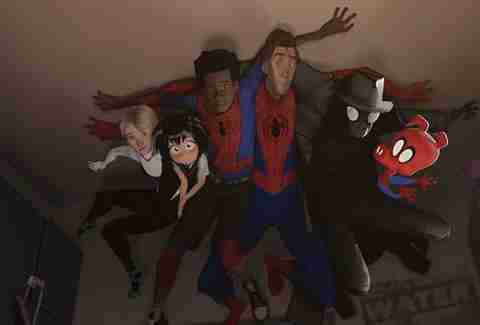 Spider-Verse's voice cast is an impressive undertaking, featuring the talents of Jake Johnson, Chris Pine, Mahershala Ali, Liev Schreiber, comedian John Mulaney, Hailee Steinfeld, and, weirdest of all, Nicolas Cage as the brooding Spider-Man Noir. He had just broken his ankle when the directors first met with him to talk about the role. "Peter and I went and met him in a hotel, and he had this cane with a skull on it, and everything covered in gold, and we were like, whoa, okay," Persichetti said. "And then we revealed the look of his character, and he pretty much was like, 'I wanna wear that.'" Of course, it wouldn't be a Marvel Comics movie without the requisite cameo from creator Stan Lee, whose appearance in this movie is made all the more touching because of his death in November. Without revealing too much about the scene, Lee's likeness appears as the cashier in a comic shop shortly after Peter Parker's death. "It's undergone layer after layer," Ramsey said of the scene. "When we first recorded it about a year ago, Stan's wife Joan had just passed away a couple of weeks before. And the scene itself is about mourning the passing of someone you knew and loved, and at the same time passing on their legacy to someone else. To watch the scene now and realize that Stan, in effect, gave his blessing in this movie about the passing of the torch to Miles as a cinematic version of Spider-Man, after his own passing... it really kind of blows me away how many echoes and resonances there are." But what really makes this movie a must-see is the groundbreaking, vibrant animation style, which the artists at Sony Pictures Animation created specifically for this movie. Spider-Verse is technically a CGI animated film, but every frame looks hand-drawn -- partially because many of them actually are. "Some of the scope and the dynamism that we have in this movie would be impossible to achieve, 90% of it, without the CGI," Persichetti said. "But the small intimate details, the expressiveness of the line work on the characters, is reliant on people's hands drawing on the screen." The process was so intense that it took about a week and a half to make just two seconds of screen time. Luckily, they built the animation "on twos," which means a new image every second frame, instead of an image every single frame, which gives the movie a jerky, flip-book look that may take a minute to get used to. "The goal was to try and capture the same thing you feel when you're looking at a panel in a comic book: the dynamism, and the strength of the storytelling that you can get out of one image," Persichetti said. "If you're gonna convince people to leave their comfortable homes and go into the theater and see something on a giant screen, we're at least gonna try to blow their minds," Rothman added. 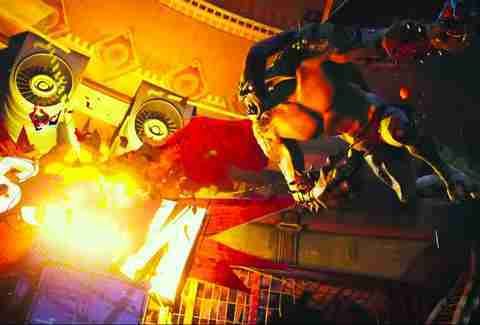 There are many scenes, especially during wild, sweeping action, where comic book sound effects like "BOOM" and "WHACK" actually appear in little text boxes onscreen for milliseconds before disappearing again. "It was designed to be very re-watchable and to, ideally, reveal things every time you see it. A lot of artists worked on the movie for a long time, and, left to their own devices, are gonna add a billion little touches that keep it fresh."